Puppy mills are commercial breeding facilities that produce puppies without regard for the health or welfare of the dogs or puppies. The dogs are kept in filthy wire cages and treated like a cash crop with little to no human interaction. When they are no longer able to produce puppies they are destroyed or discarded. The puppies are typically of poor health and have behavioral and emotional issues they will carry with them their entire lives. Puppy Mills often operate in secret selling their dogs to brokers, pet stores or uninformed consumers who are the faced with costly veterinary bills and heartache but it is the dogs that pay the ultimate price. Do your research before buying a puppy. This should include researching breeds as well as potential breeders. Make sure you visit the breeding facilities and insist on seeing the parents and facilities. If they wonâ€™t let you leave. Do not buy a dog online or from a Pet Store. 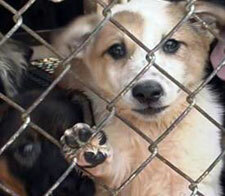 Many are just fronts for brokers and Puppy Mills. Adopt a dog! There are many dogs out there that need loving homes. Be careful to do your research as some rescue groups are also fronts for brokers. Spay & Neuter your pets. While you may not be a puppy mill, your pet having unwanted offspring can contribute to the pet overpopulation problem in America. About 4 million dogs and cats are put down every year accross the United States. That equates to about one every 8 seconds. Do your part to control the pet overpopulation by spaying and neutering your pets. Pledge not to buy ANYTHING for any store that sells puppies. Take the ASPCA Pledge!